HomeThe Canadian Vintage Radio Society, and its bimonthly publication, Canadian Vintage Radios, is dedicated to the preservation, restoration, collection and enjoyment of antique radios and related items. Canadian Vintage Radios’ regular features include: start to finish restoration projects, biographies of famous Canadian radio personalities, regional reports on CVRS activities, technical discussions of specific radio repair problems, new product reviews, some radio-related historical fiction as well as classifieds ads and an up-to-date radio collectors events calendars. Stay awhile. Take a look at our site. You’ll catch a glimpse of a magazine that’s devoted exclusively to your hobby. 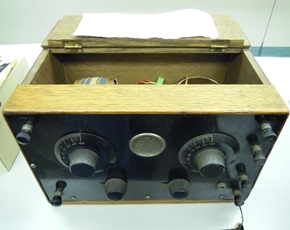 About UsThe Canadian Vintage Radio Society is dedicated to the preservation, restoration, collection and enjoyment of antique radios and related items. The CVRS is a non-profit society run solely by volunteers. Proceeds from fund-raising activities and membership fees are used to produce and distribute the publication “Canadian Vintage Radios” and to pro-mote this great hobby. CVRS was founded in 1992 by Nap Pepin in Edmonton Alberta. In 1996 the national headquarters was moved from Edmonton Alberta to BC where it remains to this day. The Atlantic Network connects CVRS members in Canada's four Atlantic provinces: New Brunswick, Nova Scotia, Prince Edward Island, and Newfoundland. Atlantic Network members who are signed in can find contact information for other members by clicking on this link to the Atlantic Network Member Directory. Random photo from our library.